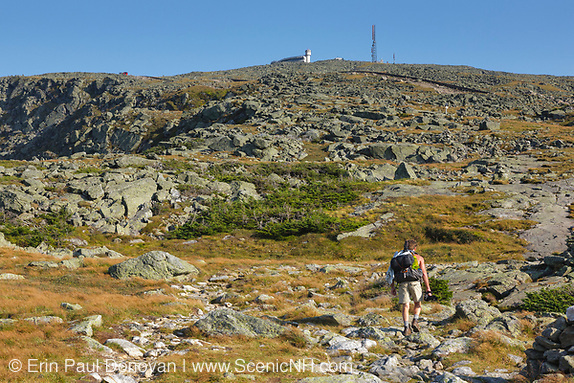 National Trails Day, White Mountains – Today is American Hiking Society’s National Trails Day, an annual event held on the first Saturday in June. The intention of this day is to celebrate and create awareness for America's Trail system. It is also a day to recognize the work of all the volunteers who do trail maintenance along America’s trail system. 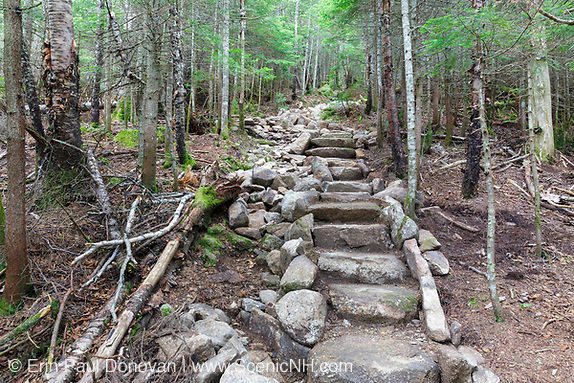 My photography work is mainly done in the New Hampshire White Mountains these days, and I see a lot of the work trail maintenance groups and the volunteers of the adapt-a-trail program are doing to better the White Mountains trail system. Unfortunately, I have also seen the destruction done to our trails when volunteers are not properly trained, but that is for another day. 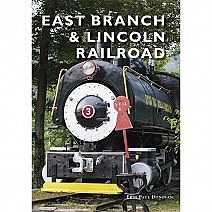 Trail Construction and Maintenance, White Mountains – In 2011, Tropical Storm Irene caused massive destruction along the East coast of the United States. The White Mountain National Forest was officially closed during the storm. Many trails in the White Mountains were damaged, and required extensive trail work. 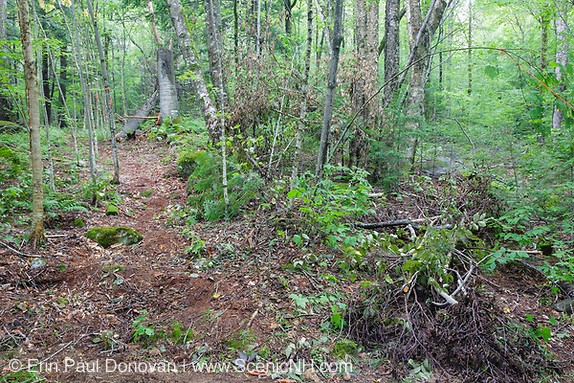 And this series of photos shows the trail work done to one trail that suffered storm damage from Tropical Storm Irene. A section of the Mt Tecumseh Trail washed out and had to be rerouted. The above photo shows the junction of the trail reroute (left), and the section of trail that washed out (right) shortly after a Maine Forest Service crew cut the reroute in 2011. Forest Service chose the reroute location and marked it, and a Maine Forest Service crew, helping reopen trails damaged from Irene, did the cutting. The closed section of trail was also brushed in. This information is direct from Forest Service. Note the tree in the reroute (left) with the orange flagging on it. 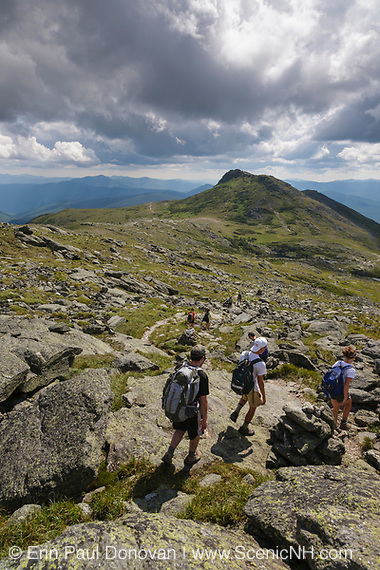 National Trails Day, White Mountains – Today is American Hiking Society’s National Trails Day, an annual event held on the first Saturday in June. And the intention of this day is to celebrate and create awareness for America's Trail system. It is also a day to recognize the work of all the volunteers who do trail maintenance along America’s trail system. As environmental photographer and a hiker of the New Hampshire White Mountains, I appreciate all the work that volunteers do along the White Mountains trail system. And to all you adopt-a-trail volunteers, who are truly only volunteering to give back to the White Mountains, THANK YOU. 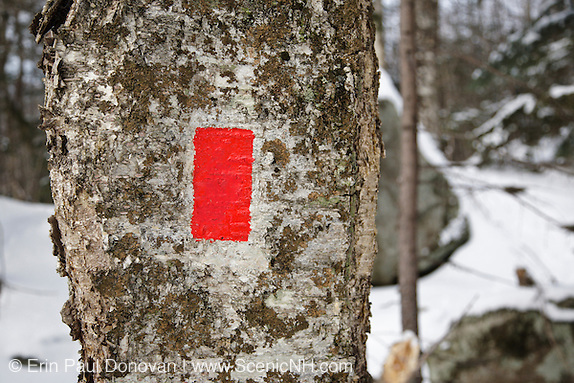 Trail Blazing, Trail Stewardship – Painted trail blazing (paint marks on trees that mark the path of a trail) along the White Mountains trail system is an endless complaint among outdoor enthusiasts. Either the trail is excessively blazed or not blazed enough. I don’t mind the trails that have little trail blazing, but I'm not a fan of the excessive trail blazing. Proper trail blazing protocol seems to vary among the trail maintenance organizations, but the ending result is the same. Most of these organizations agree that a standard trail blaze is a two inch by six inch rectangle placed about head height on trees. No painting of arrows, only a single vertical blaze, should be painted on a tree. For more information on blazing see the Randolph Mountain Club’s trail blazing protocol page. Mt Tecumseh Trail, New Hampshire – For five years (2011-2016), I documented issues on Mt Tecumseh in New Hampshire. In my opinion, what has happened to the Mt Tecumseh Trail over the last few years is a disgusting display of conservation and trail stewardship. The new stonework built along this trail is all about quantity, not quality, and I question what low impact, sustainable, trail work is. Scree Walls, Trail Stewardship – Today’s blog article focuses on a keyword search term. I chose one search term in this case “scree wall” and searched my image archive to see what imagery I have available that represents this area of trail stewardship. As photographer, these keyword searches help me determine what subject matter I need more coverage of. The below imagery showcases this search term. 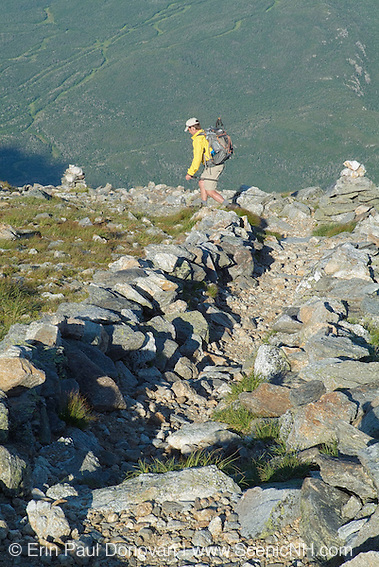 In the alpine zones of the New Hampshire White Mountains, trail stewards build scree walls on the edge of trails. These non intrusive walls keep hikers on a defined path in the alpine zones, and this helps protect the fragile alpine habitat. Some of the alpine flowers that grow in New Hampshire are rare and only grow in the alpine zones of New Hampshire so protecting this habitat is essential. Rock Cairns, Trail Stewardship – A rock cairn is a man-made pile of rocks that marks a landmark or the route of a hiking trail above tree line. 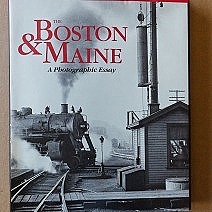 They have been used for many centuries and vary in size from one foot to massive piles of rocks. The word “cairn” is Scottish and means a “heap of stones”. Cairns are found throughout the New Hampshire White Mountains, and they make great photo subjects. 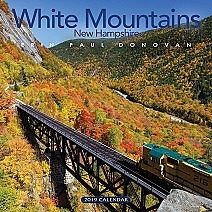 My favorite ones are along the Appalachian Trail on the summit of Mount Moosilauke. For some time now there has been an increasing concern about rock stacking (random piles of rocks) on public lands. People are innocently building rock cairn look a likes along beaches, rivers, and trails, and it is drawing both positive and negative attention. Out west, rock stacking is a major problem. 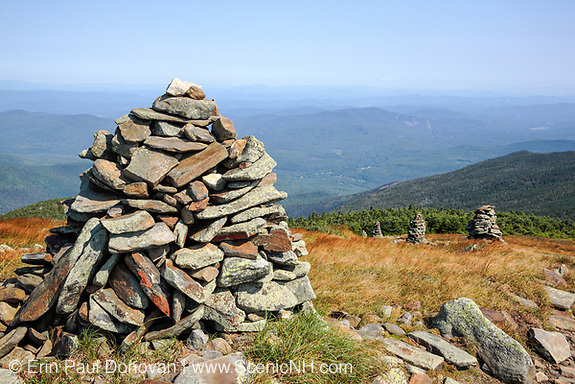 Here in the White Mountains, fake cairns built along the trails can cause navigation confusion for hikers, but that is for another blog article.